India’s economic growth may seem to have taken a dip last year with India’s GDP growth falling to 6.9% for 2011-12 from 8.4% the previous year. But that has not translated into a slower entry of international brands entering the market. There already exist over 200 international fashion brands in India with more than a quarter of these operating predominantly in the footwear and accessories category. Bata may be an exception, having been present in India for over eighty years, but since the 1980s international brands have been trickling in, and the numbers really picked up in the 2000s. Since 2006, the number of international shoes and accessories brands entering the market has increased 4-fold. The year 2012 has already ushered in international brands such as Claire’s (jewellery), Christian Louboutin (shoes) and Kelme (sports shoes and apparel) within the first three months, while more brands are there on the anvil. While India is expected to grow at 7.6% this year, the pace of growth of international brands may just as well surpass this relatively slow growth rate. The choice of entry strategy is a key decision for brands entering new markets. This decision hinges on internal and external business factors including the degree of control that a brand wants to exercise on the brand, the product and the supply chain, the market potential, the internal capabilities and strategies of the international brand in their home market or other overseas markets and the government policy pertaining to foreign investment in that particular market. In the late 1980s and 1990s the Indian retail market was largely unorganized with few national Indian brands and an under developed modern retail network. Import duties were high and there were many investment barriers for foreign brands. The early players entering the market in the shoes and accessories segment were primarily sports footwear and equipment brands targeting the Indian men. Bata was perhaps a lone brand that offered footwear for the entire family. The international brands that entered the Indian market at that time largely opted to license the brand to an Indian partner that allowed the international brands to gain quick access to the Indian market with a minimal investment. Brands such as Lotto, Hush Puppies and Puma chose to license the brand to a partner based in India. The Indian partner invested in sourcing or manufacturing, merchandising, branding, marketing, distribution, and even retail while the international brand received royalties and other fees for lending its brand to the market. However, this left the brands with very little control on their growth path in the market. A few formed joint ventures (Reebok, Adidas) or entered into licensing and distribution tie-ups (Nike, Umbro) with Indian partners to leverage the partners’ manufacturing or distribution strengths. Over time, certain brands decided to move their existing entities (licensed, franchised or joint venture) into wholly owned subsidiaries. These brands may have invested a disproportionate amount of management time and effort initially but the investment has paid off well. Reebok is today the largest international sports goods brand in India with a reported turnover of Rs 600 crores last year, followed by Adidas, Puma and Nike. The 2000s saw a rising interest of women’s footwear and accessories brands in the Indian market as the market further evolved. Many of these players operated in the luxury segment appealing to a limited few. There was a distinct shift in the choice of entry strategy and franchising emerged as the preferred entry route for the brands stepping afoot in the Indian market testing the waters. The successive lowering of import duties for fashion products resulted in imports being a less expensive sourcing option and the realty boom brought investors in retail real estate that were ideal franchisees for the international brands. At the same time the count of sports footwear and accessories brands also continued to grow. This product category was primarily distributed through agents, regional distributors and through a combination of exclusive branded outlets, multi-branded outlets and large department chains at the retail end. 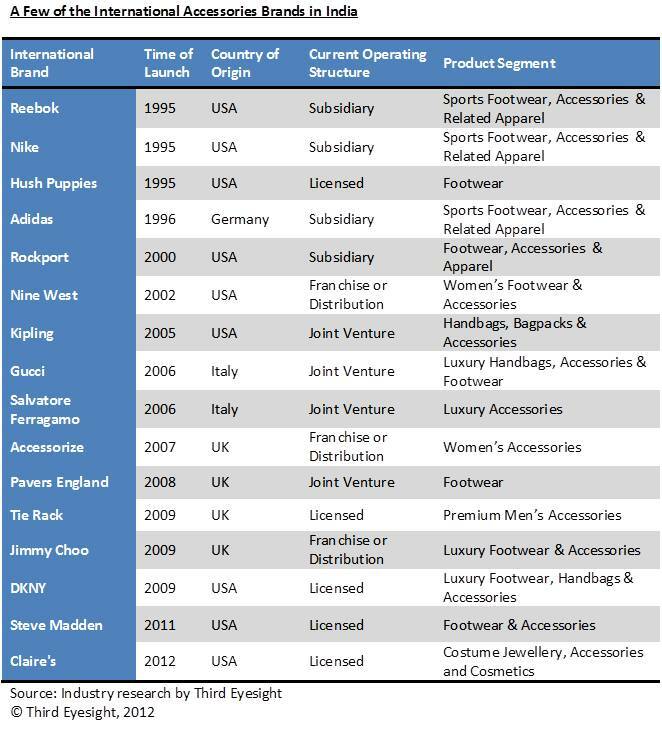 By 2003, franchising became the preferred launch vehicle for an increasing number of international companies, including Accessorize, Aldo, New Balance and Nine West, while only a few chose to enter through licensing. In 2006 the Government of India reopened retail to foreign investment (allowing up to 51 per cent foreign direct investment in “Single Brand” retail). Later the Indian government also announced the possibility of gradually increasing the FDI limit in single brand retail from 51% to 100%. The possibility of having part or an eventual complete ownership encouraged brands, seeking a more controlled business in India, to use joint venture as the launch vehicle. International footwear and accessories brands such as Clarks, Fendi, Kipling, Pavers England either entered India by forming joint ventures or shifted their existing structures to joint ventures. Thus the last decade saw the international brands largely using the franchising route or forming joint ventures to create a presence in the Indian market. While franchising became the choice for risk-averse brands, those that were convinced about the longer-term value of India took the more committed ownership route. While the government has recently allowed 100% foreign direct investment in single brand retail, it has placed the rider that 30% of the sourcing would happen from small and medium enterprises in India. The lack of clarity as to what this actually means, as well as the need to set up an adequate sourcing presence in India has meant that most brands have not pushed their Indian presence into a 100 per cent ownership structure. Of course, for a few brands India may be the key source for their entire range and given our government’s manufacturing policy they may already have an existing small and medium enterprise vendor base. These brands may go for complete ownership if India is a strategic and important enough market and sourcing base in their global portfolio. One such international company is Pavers England, a premium leather footwear brand from UK, which has recently approached the Indian government to allow the retailer 100% foreign direct investment in single brand retail. The group has been present in India since 2008 through a joint venture and currently sells the brands, Pavers England and Staccato in India. 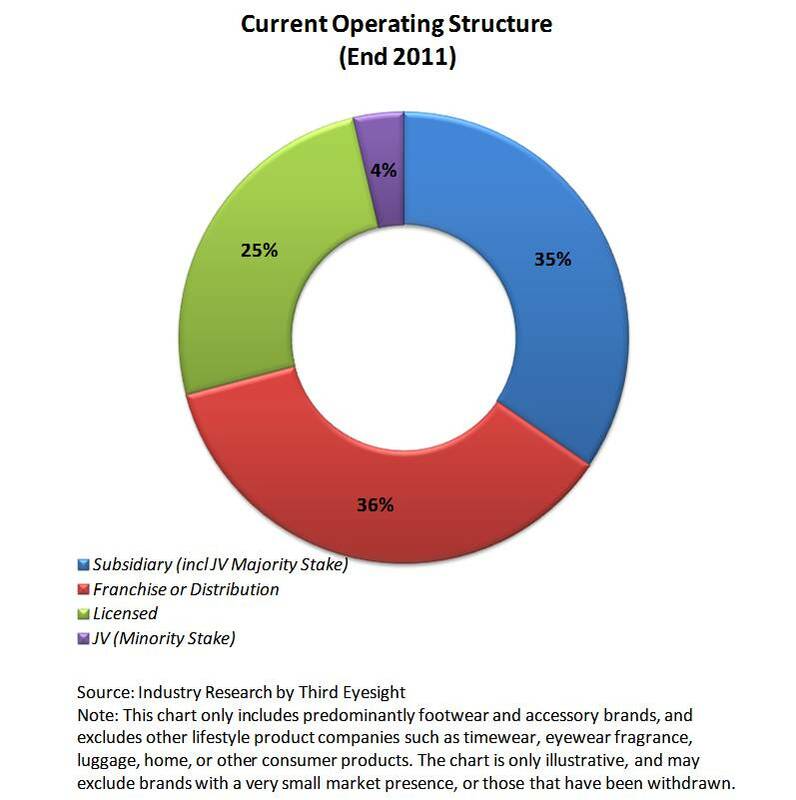 At the moment, 35% of the international brands are present through an ownership business model, either through a wholly owned subsidiary or a joint venture with majority stake which reflects the growth of confidence level of international brands in the Indian market. The road to success in the Indian market has not been an entirely smooth ride even for the large brands that are successful globally. Brands that have invested in understanding the psyche of the Indian consumer, adopted flexibility in market approach and displayed persistence, have been paid off handsomely and some of these have even exceeded domestic brands in size and reach. Some others have had to reconcile to being niche operators. Some brands have shifted their strategy and changed their operating structures and even partners in response to the dynamic market conditions and the increasing importance of India’s contribution in their global business. Some brands that may not have achieved success in their initial stint and have exited the market, only to return with renewed strategy, energy and rigour and more suitable business models and or partners. There are plenty of examples of international brands that have changed over their operating structure, partners, exited the market and yet re-launched again. Puma, for instance, had first entered the Indian market through a licensing arrangement with Carona in the early 90s to sell sports footwear, but the agreement was revoked in 1998. The brand entered the market again in 2002, this time with a licensing / distribution tie up with Planet Sports. The company positioned itself as a lifestyle brand this time with a wider product range. While the Indian partner was responsible for sourcing of apparel and accessories, distribution and retail, Puma ensured that the quality of footwear being sourced from India was upto mark and also ensured brand consistency throughout all marketing, product and retail efforts. To the international company, India occupied an important position in Puma’s global as well as Asian business. With an aim to strengthen the brand’s position further in the country through greater control over its India operations, Puma set up a wholly owned subsidiary in 2006 subsequent to the end of its licensing tie-up. Another early entrant, Lotto Italia, re-entered the market in 2005 through a license deal after a gap of ten years. More recently, in an effort to move to the higher growth trajectory, the brand has changed its partner last year and the brand is looking for aggressive growth by planning to grow its network of exclusive stores across India from 50 at the moment to 200 in the next three years. The brand is also undertaking various marketing activities to gain high visibility and connect with the consumers. Recently, the brand has been reported to be working on launching cricket equipment in India in the next six months, which will be a pilot run for the global launch of the product as well. The renowned Italian brand Gucci was brought into India through a franchise agreement with Murjani Retail in 2006. However, the global economic crisis and its resultant impact on the Indian market, led a shift in the Indian partner’s focus from luxury to premium brands. The franchise agreement with Murjani Retail was terminated and replaced with a new franchisee, Luxury Goods Retail, in 2009. Simultaneously, the international brand Gucci, converted this new franchise agreement into a majority owned joint venture for more control over the Indian operations. Clarks, a British footwear brand, first entered India in 2005 through a distribution agreement with an India partner and also set up a few exclusive stores across India. It withdrew from the market due to below-par performance. However, after researching and understanding the Indian consumer further it re-entered the market 2011 through a joint venture with Future Group. Now Clarks is offering differentiated products across segments (men, women and kids) with lower price points and is focusing on high brand visibility through exclusive branded stores to break through the clutter. India is an important sourcing base for this company and it is also drawing synergy for its global product range from the products being developed as per the tastes and preferences of Indian consumers. From the new partner the brand hopes to leverage their experience in real estate and their understanding of the Indian consumer. The Italian fashion brand Miss Sixty exited the market and their partnership with Reliance Brands in 2007. The brand re-launched shoes and accessories in 2009 through another franchise agreement and currently the brand has three stores across Delhi, Mumbai and Chennai. The German lifestyle brand, Aigner that entered India in 2004 is perhaps a lone brand that has not yet re-entered the market since its exit in 2010, but it will be no surprise if it returns to India again at an appropriate time. The strategies of international brands have changed due to various factors. Many of the changes in strategy and structure have been due to the actual performance in the market falling well short of expectations and projections. Perhaps, the changes in partnership could have been moderated had the companies been more careful in questioning the criteria and motivations for choosing partners. (This is discussed further in detail in our earlier articles, relating to the International Fashion Brands in India). In choosing their partners, the international brands need to carefully identify what role they wish to play in the market, and what capability and capacity they need operationally to create the success that can truly root a brand into the rich Indian soil. India is at the early stage of consumer growth and is emerging to be a strategic market to many international brands with a promising market potential. The market conditions are much better and the barriers to entry much lower for the international brands as compared to even the last decade. The overall confidence of the international brands in the potential of the Indian market is highly positive. So far, the shoes and accessories market has been led by international sports and outdoors brands. Though there are already over a dozen international brands present in this category, we can expect to see more entering this category. The recently announced joint venture between Wolverine and Tata International to strengthen the presence of CAT and Merrell brands in the Indian market and to possibly introduce other brands from the portfolio shows that this segment is far from saturation. Indian women are emerging as another important segment, drawing more footwear and accessories brands into the market and expansion of the existing brands through stand alone stores for women. There is still open ground available in the premium and value segment of women’s accessories for the growth of both international and national brands. Over the last decade, the pace of growth of a brand has accelerated; the time needed for a brand to scale up has shortened. The modern retail network has expanded and there are an increasing number of distribution channels today, even as existing players such as Bata and new ones such as Reliance Footprint offer growing platforms for international accessory brands to plug into. The online channel is further emerging as an important route to reaching the consumers especially in the tier II and III cities where demand exists but there is low accessibility due to inadequate distribution network. Vans Shoes, an international footwear brand from USA, has tied with online portal myntra.com to widen its consumer reach having entered India last year through a joint venture with Arvind Brands. The online channel also offers the possibility of “pilot runs” and test marketing for brands at the early stage. Going further, not only do we see more brands customizing their product range for Indian tastes, but India also becoming the testing ground and an inspirational source for global product range. International brands clearly are here to stay. The more successful brands will be the ones that take pragmatic view of what is achievable and make course-corrections to their India business model as often as required.